Often you will search for a particular product on Amazon and find what seems to be the same exact thing listed twice or more, just slightly differently on each page. Headphones and hard drives seem to be the biggest culprits for this. Here are a few tips to identify what's what. For headphones, if an "i" is tacked onto the model name (eg. "Klipsch Image S4i"), it indicates an inline mic/volume controller designed for Apple products. If an "A" is tacked onto the model name (eg. "Klipsch Image S4A"), then it indicates an inline mic/volume controller designed for Android products. Don't let a name like "Klipsch Image S4 -II" confuse you either — that is referring to a more recent line of those headphones. "Klipsch Image S4i - II" is the current listing for the Apple inline mic/controller version of the latest line of Klipsch Image S4 headphones. Hard drives get especially confusing for two reasons: One, there are an incredible amount of models and sizes for both Mac and Windows of similarly named drives from each company. (eg. 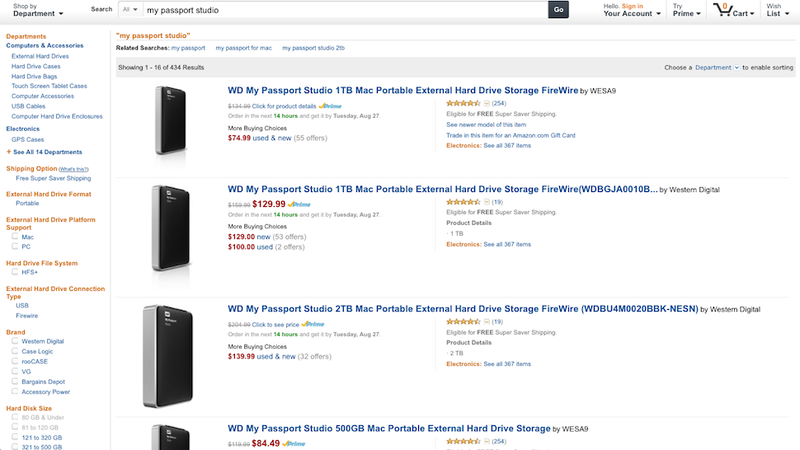 Western Digital portable external drives: My Passport, My Passport Ultra, My Passport Enterprise, and then the Mac versions: My Passport Air, My Passport for Mac, My Passport Studio). The other reason is that there are some instances where the same exact model of a product is listed twice, with the smallest, silent difference of an updated model number on one page. One, go to the official product page on the manufacturer's website and find the model number listed. You can even just search that model number on Amazon to find the right listing if one of the two pages doesn't match. The other way is to just compare the "Date first available on Amazon.com" under Product Details to see which one was added more recently. Amazon usually does a good job of connecting different versions/colors/sizes of products into one page, with clickable options to choose between the different versions of the same product. Their search results can be a bit of a mess, though. They could cut the product names down and list them once in the search results instead of describing every feature and difference in the title and listing the same product multiple times. Know any other tricks to weeding through Amazon's search results? Comment below.